Downhill from Blackheath Village in south-east London there is no trace of the Ferrier council estate, where concrete tower blocks and houses have made way for Kidbrooke Village, above. 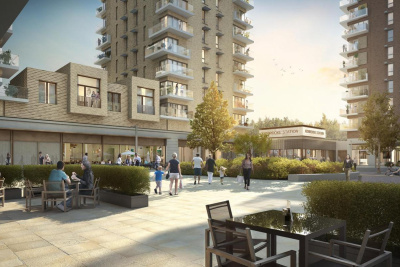 Described by developer Berkeley Homes as a “new garden suburb”, this once blighted area now has new homes, shops, a school, a health centre, leisure facilities, a hotel and a new transport interchange at Kidbrooke station, offering a 15-minute commute to London Bridge. It is a surprisingly green setting, bordered by attractive Sutcliffe Park, which has a lake and wetlands, with landscaped areas across the 276-acre estate. Flats and townhouses with roof terraces overlook this green expanse, and buyers are looking here with fresh eyes. Properties are a step up for the area, with smart, space-efficient interiors. A new three-bedroom “urban house” design features a roof garden rather than a conventional back garden, while the space-efficient back-to-back terrace format means twice as many homes can be built.